These ergonomic mesh chairs feature a thickly padded contoured seat in your choice of black mesh fabric or top cowhide leather. 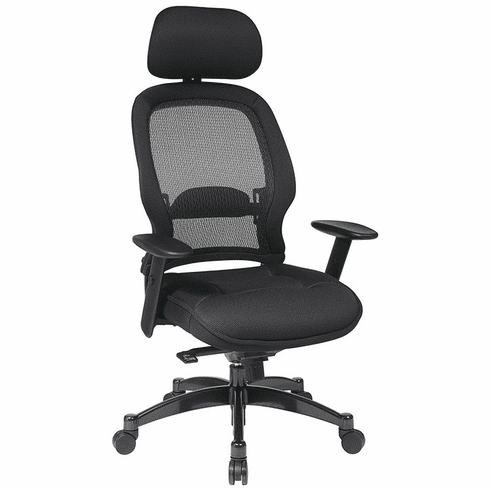 Features Herman Miller Aeron chair styling including a mesh screen back, adjustable lumbar support, adjustable armrests, height and depth adjustable headrest, infinite lock 2-to-1 synchro tilt with tilt tension control (back reclines at a 2-to-1 ratio to the seat angle. Allows user to recline while keeping seat cushion relatively level to floor. Chair can also be locked in any tilted position), knee tilt control, pneumatic seat height adjustment and a heavy duty metal base with dual wheel casters. These mesh chairs normally ship within 2-3 business days from our CA warehouse.